Banquet was created by Hirsch in 1945 for publication by the Associated American Artists (AAA). Founded by Reeves Lewenthal in 1934, the AAA created original and signed prints in editions of 250, which it distributed for $5 per print or the equivalent of about $85 in 2018. Through department store and mail order sales, as well as traveling exhibitions, the goal of the AAA was to stimulate the American public’s interest in owning fine works of art. Hirsch’s print comments on the state of the workplace in the 1940s. Following the start of World War II, there was a high demand for workers in war-related industries. However, African Americans were often denied better-paying jobs and were discouraged from joining the military. In 1941, labor and civil rights leader A. Philip Randolph (1889— 1979) threatened a mass march on Washington, D.C., in protest of racial discrimination in industry and the military. In response, President Franklin D. Roosevelt (1882—1945) issued Executive Order 8802 declaring that “there shall be no discrimination in the employment of workers in defense industries or Government because of race, creed, color, or national origin.” Seven years later, Randolph’s advocacy led President Harry S. Truman to ban segregation in the armed forces. Hirsch, who was white, created this print four years after Roosevelt’s executive order. He portrays two factory workers eating lunch side by side. 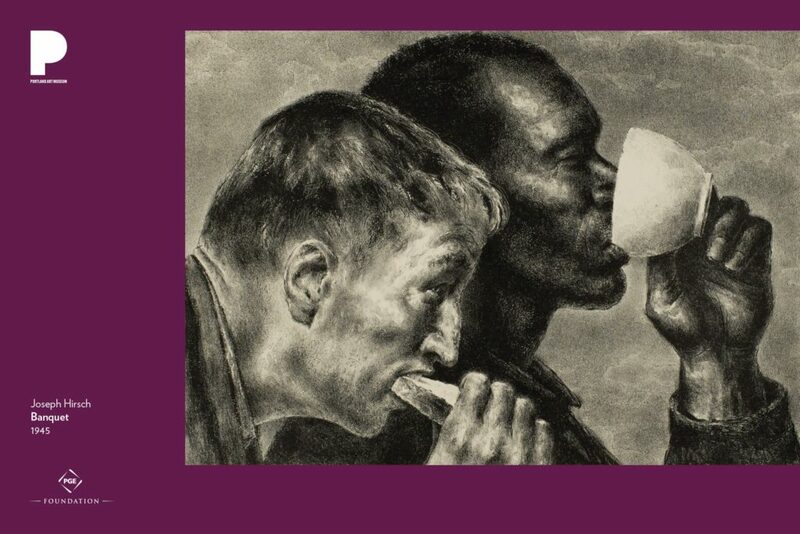 A white man bites down on a piece of bread, while an African-American man drinks his last sip of coffee. The men are depicted in profile from a perspective that positions us—the viewers—at an equal level, perhaps as another worker on break or a fellow customer at a lunch counter. The print depicts the ideal of racial unity in the workplace and sheds light on these crucial early decades of the Civil Rights Movement. Hirsch created this print through the process of lithography—a printing process based on the fact that grease and water do not mix. Invented in the late eighteenth century, lithography is a technique which involves drawing on a flat surface, traditionally limestone, with a greasy substance such as a crayon or a liquid called tusche. Once the image is completed and ready to print, the artist applies a chemical mixture on the surface of the stone to secure the image in place. Water is then applied to the surface, adhering to the non-greasy areas of the plate and allowing the artist to roll ink only onto the image. A sheet of paper is placed atop the stone and rolled through a press, allowing the ink to transfer from the stone to create a print. Describe the figures in Joseph Hirsch’s Banquet. Consider Hirsch’s use of perspective and of chiaroscuro (the strong contrast of light and dark). How do the formal qualities of the print communicate ideas of human dignity and equality? The men in this print appear to be eating a simple meal. Why do you think Hirsch titled the work Banquet? What do you think the artist Joseph Hirsch meant when he said, “I believe that someday the fabric of art will be threaded with morality, enabling us to distinguish evil from good”? How does this artwork, Banquet, convey Hirsch’s moral sense? Do you believe that art has—or should have—moral qualities? Does art impact people’s ability to distinguish good and evil? Provide specific examples to illustrate your response. Think of a moral or political issue that matters to you. How would you depict that issue as visual art? Would you choose to include text or a caption or do you feel you can communicate your ideas entirely through the image?